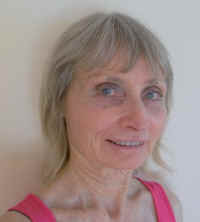 Jenny Moxham has been a vegetarian since 1977 and a vegan since 1979. She became 'converted' to vegetarianism after being saddened to see a truck load of cattle bound for slaughter and shortly afterwards, discovering that meat wasn't required for a healthy diet. She tries to alleviate animal suffering whenever and wherever she can and writes lots of letters to the newspapers on issues concerning animal exploitation/cruelty and vegetarianism. She has put up library displays, taken humane education kits to local schools, attended demonstrations, designed animal-friendly Christmas cards, organized a campaign to have councils stop celebrating with fireworks and has worked on getting compassion for animals into the schools and churches in her area. She has also spoken at several churches in her area regarding compassion for animals. Her first poem was written after walking down the street one Spring day and rejoicing in the beauty all around her ... and then realizing that millions of incarcerated factory-farmed animals will never know a Spring. She went home and wrote, They Will Never Know A Spring. After that, various situations/events inspired her to write further poems. Her song, A VOICE FOR THE ANIMALS won the Animal Liberation New South Wales poetry competition in 2000 and her poems have been published in various magazines and newspapers. Jenny Moxham (May 2012) proudly presented Volume 1 of insightful Animal Rights Poetry via Amazon. These 25 poems were written to inspire kindness and compassion for animals and to raise public awareness about the routine suffering inflicted on them at the hands of man. The poems are written in an easy style and will hopefully inspire readers to take up the cause for animals.